I'm writing this as I sit in my friend Dave's beautiful open-air living space perched above one of Bali's loveliest rivers. The smell of incense is in the air and around the lotus pond frogs are serenade me and each other. Dave lives just a five minute walk from Ubud's center but this house is a world away from the town's crowded shops and galleries. I'm staying in Bali while Burt is guiding the Yacht Athena through Raja Ampat. I've had two weeks of Bali bliss after our trip to Lembeh Straits where we experience some of the best critter diving in the world. I'll try to catch you up on the last month of diving and wandering through Indonesia. We arrived in Manado on the green, volcano-strewn island of Sulawesi in mid-October. Our first stop was the incredible Minahasa Lagoon Resort, about 45 minutes away from the center of Manado. I hate to say it, but this resort is almost too nice for divers. The service was superb and the food incredible. Of course we were there for the diving and it also surpassed our expectations. The walls of Bunaken National Park were as lush and filled with fish as promised, but our group wanted to hunt critters, in anticipation of Lembeh. With Minahasa's expert guides we saw and photographed animals as diverse as Flamboyant Cuttlefish and Pegasus Sea Moths. On one dive a tiny Painted Frogfish landed on top of a white Scorpion Leaf Fish! But the main act was waiting for us at the Lembeh Resort on Lembeh island. Long famed for it's wealth of unusual marine animals, Lembeh did not disappoint. Although Burt and I had spent several months diving the straits with Larry Smith a decade ago, we were thrilled to learn that Lembeh is one place that is better than it was when we first dived it...something you can't say about may reefs in the world! Highlights were sightings of Blue Ring Octopus on four different occasions. We photographed a total of eight octopus species including the Motote, a small relative of the Blue Ring we had never seen before. When we arrived in Lembeh,Kat and Johan the very capable dive ops managers at Lembeh Resort asked us to list the animals we wanted to see. They teamed us with Ronald, an expert guide and friend of many years. For two weeks Ronald was in a zone and even found the very elusive Hairy Octopus! Our portfolio now includes the cockatoo flounder, a mantis shrimp with eggs that posed for several minutes, numerous sightings of the mimic and wonderpus octopus, a pregnant warty frogfish, and the utterly beautiful Tiger Shrimp. Divers become addicted to Lembeh, There's no place else where finding and photographing elusive animals is so easy. One of our photography week participants, Tony Kressic from Chicago, said it was absolutely the best trip he'd ever been on. Tony's photography skills improved so much during the week, he may have gotten the best Blue Ring shot of us all! 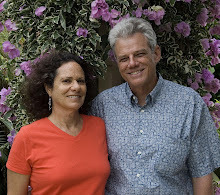 Jack and Nancy Malo, veteran divers and photographers from Minnesota, were thrilled with the ease of diving Lembeh and came down with a bad case of PCO, or progressive critter overload, as our friend and Lembeh pioneer, Larry Smith used to say. When Burt returns from Raja Ampat we'll take a short break and travel to Java for a few days of photographing temples and checking out some of Indonesia's best crafts in Yogjakarta. We'll return to Bali and prepare for a month in Papua where we'll dive the best sights in Triton Bay and Raja Ampat.